"The award winning machine-made Coca-Cola glass of the glass collection Restaurant O is inspired by the iconic curves of the original Coca-Cola bottle and enhances the taste of this cult drink. 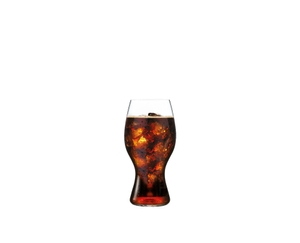 Shaped by trial and error by a panel of industry experts and Coca-Cola lovers, the glass captures the distinct spices, aroma and taste of Coca-Cola to create a magical sensorial experience. "O" is the ideal glass for everyday use and for every occasion. It is fun, feels good to hold, looks trendy and it works! All RIEDEL glasses are dishwasher safe. "